A nine-foot-tall trophy featuring a large gold and sienna head of Donald J. Trump on a gilded plinth is scheduled to be dedicated in Las Vegas next month before the election. The monumental statue, believed to be the World’s Largest Participation Trophy, in honor of Donald Trump’s presidential run, was sculpted by the commissioned artist Daniel Edwards. The dedication is scheduled for November 4, 2016 announces Cory Allen Contemporary Art. 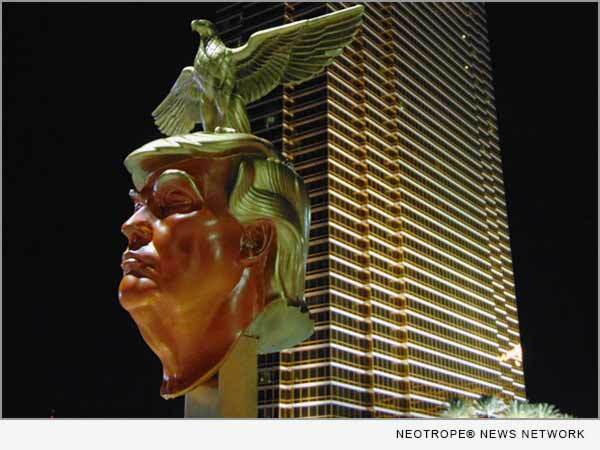 eNewsChannels NEWS: LAS VEGAS, Nev. — A nine-foot-tall trophy featuring a large gold and sienna head of Donald J. Trump on a gilded plinth is scheduled to be dedicated in Las Vegas next month before the election. The monumental statue, believed to be the World’s Largest Participation Trophy, in honor of Donald Trump’s presidential run, was sculpted by the commissioned artist Daniel Edwards. The dedication is scheduled for November 4th, announces Cory Allen Contemporary Art. The “RNC Participation Trophy for Donald J. Trump, Election 2016” is a heroically scaled bust of Trump, recalling the idealistic portraits of German sculptor Arno Breker. It is fixed atop a six-foot-tall gold-chromed podium, which resembles the Trump Hotel. Trump’s sienna-colored likeness has a jutting chin; his sweeping hair is gold-leafed with golden eyebrows to match, and he is crowned with a German eagle as a nod to his German heritage. Portraying the heroic scaled likeness of Trump himself as a companion piece to the Trump Hotel Las Vegas, with glitz and grandeur to match, dedication of the RNC Participation Trophy is scheduled to take place in its vicinity. Despite the conceding of his own party and campaign that he is behind in the polls, Trump maintains he is winning. The Trump award is the inaugural presentation of the RNC Participation Trophy. No word on whether or not future presentations will maintain Mr. Trump’s likeness to represent the participation award in perpetuity. “RNC Participation Trophy for Donald J. Trump” will be dedicated at 11 a.m. November 4, 2016 in Las Vegas. Press may contact Cory Allen at 323-393-3115 or visit www.cacanet.com to RSVP for exact location of media conference and dedication ceremony. Photo Caption: “RNC Participation Trophy for Donald J. Trump” by commissioned artist Daniel Edwards. Neither the RNC nor Mr. Trump commissioned, authorized or endorsed this sculpture and have no relationship to its display or deployment.